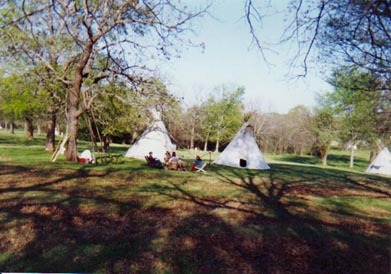 FT. WASHITA ( INDIAN TERRITORY ). 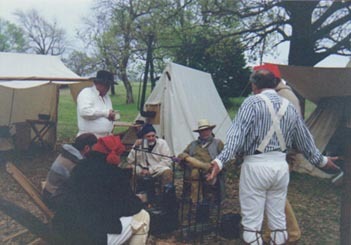 THE OLD FORT IS LOCATED APPROX: 12 MILES EAST OF MADILL, OKLA. RENDEVOUS IS HELD IN THE SPRING OF EACH YEAR. THE OKLA. HISTORICAL SOCIETY OVERSEES THE EVENT, SINCE THE FORT IS A STATE PARK, SURROUNDED BY CORP. OF ENGINEER LAND. THE CAMP GROUNDS ARE WOODED AND WELL KEPT. THE RUINS OF THE OLD FORT ARE STILL PRESENT. YOU WILL FIND TEEPEES, WALL TENTS, BELL TENTS GALORE. YOU WILL FIND RE-ENACTORS ENGAGED IN THE FRENCH-INDIAN TIME PERIOD, ALSO THE FUR TRADE PERIOD AND THE REVOLUTIONARY WAR PERIOD. TRAPPERS AND TRADERS COME FROM ALL OVER TO ATTEND THIS ONCE A YEAR EVENT. FAMILIES ARE THERE AS WELL AS LONE TRAPPERS. THE TRADER ROW IS WELL PRESENTED BY A LARGE NUMBER OF WELL KNOWN SUPPLIERS. ENOUGH ITEMS FOR CAMP, CLOTHING AND SHOOTING ITEMS ARE THERE TO BE HAD. SO BRING YOUR PLEWS AND TRADE THEM AWAY. THERE ARE SEVERAL SHOOTING EVENTS. EVENTS FOR THE LADIES AS WELL AS THE YOUNG ONES. A SATURDAY NIGHT COMMUNITY FEED IS THERE FOR ONE AND ALL. SO GRAB YOUR MULE AND POSSIBLES AND COME TO RENDEVOUS!! !